Okay. So I have a confession to make. I haven't always been this "crunchy" or health concious. When I was a kid, even in my 20's when I could seem to eat most anything and get away with it (oblivious that food was causing my slowly creeping health issues) I ate the occasional Hostess or Dolly Madison snack cake. I wasn't really a big fan of them, other than the Raspberry Zingers and maybe the honey buns (talk about high fructose corn syrup and gluten). Mmmm. The combination or berries and my love of coconut drew me to the Zingers. I never felt so great after scarfing one down, but they were good on my tastebuds! Recently I was experimenting with Paleo muffin recipes, and wanted a muffin of sorts. I happened to have berries and coconut on hand; I made a version of these, and when I ate one, I noticed a familiar taste, but wasn't sure what it was just then. I realized a few days later that I had stumbled upon a muffin that tasted like raspberry zingers, but was much healthier. Awesome! The only thing missing from these is a cream center. I suppose you could make a cream filling of some sort and use an injector or spread on top like icing if you really felt it was needed, but I like them as they are. I originally made these with a few tablespoons of butter and they were delicious, but I tend to have a slight intolerance to dairy. So this time around I left the butter out and subbed for some coconut oil. You don't have to use either as they still turn out well as long as you use full fat coconut milk, depends on your preference. I know many people who are dairy as well as gluten intolerant, and if so this recipe can adapt to your needs. Thaw the frozen berries in a sieve or colander. I like to cut mine up into smaller pieces (halves and quarters) to distribute the berries throughout the muffins. You can use fresh, too. It's cheaper to get a frozen medley than buy 3 different kinds of berry cartons. Even in my home state of California fresh berries can be pricey. Coconut - I like to buy a large bag of the coconut flakes, so I can use them for other recipes like coconut chocolate bark with coconut oil etc. I take the large flakes and grind them down a bit in my mini food processor for these muffins. In a large bowl mix the dry ingredients. In another smaller bowl whisk the eggs, vanilla, and almond or coconut milk. Add the wet to the dry along with the coconut and berries. Mix until incorporated. You can add a bit more milk if the batter seems thick or even some butter or coconut oil if you want them to be richer. The batter should be a consistency between cookie dough and pancake batter, but not too thin. Spoon the muffin batter into a greased muffin pan (coconut, butter or other oil) or use silicone muffin wrappers. It makes cleaning your muffin pan so much easier! Tip: coconut flour tends to be moist, so if you use just the muffin tin, make sure it is a non-stick one. If you use paper wrappers, I recommend letting these cool fully, otherwise they are hard to get out in one piece. The silicone wrappers are no problem however. Cook 20-30 minutes or until tops begin to brown and centers seem done. You can always do the toothpick test. I know it's been a while since I've posted anything. I've been dealing with some health issues related to my gut imbalance, and now that I am getting back to my old self I have something else that has distracted me.....I'm 3 months pregnant! Needless to say my hubby and I are ecstatic. However, the last several months have been challenging for me with nausea and fatigue. I plan to get back on the horse and blog again, but for now I may be taking a bit of a hiatus. 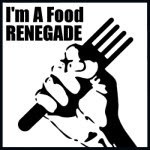 In the meantime, please enjoy my existing articles and recipes. I'm a whole foods kind of gal, and I make a lot of my own meals and snacks from scratch every weekend in preparation for the upcoming week. This weekend I was on a roll and made more than usual, because I was excited to make a few new recipes. I learned to make yogurt with my new yogurt maker, made some yummy almond power bars, and my favorite of all time - cheesy kale chips which are vegan - and I might add - addictive! It's great to have these time-saving tools to help me out so I have time to spare to enjoy the rest of my weekend. Once I'm done making my delicious and nutritious meals, you'll find me at the beach or hiking in the Santa Monica mountains. Last week, I went to Malibu beach with my sister and two nieces. We ran in the water, enjoyed some sun for probably the last time this season, and then walked across the street for some fresh seafood. Eighty degrees in November! How I love southern California! We are so spoiled. I use my handy dandy food processor to make almond flour, cashew cream, cake and cookie batter, .... this gadget does it all. It will chop, knead, slice, grate and blend. The blender attachment - I use this almost every morning to make my protein shakes. Add a little milk (or alternative milk), protein powder, and get creative with nut butters, cocoa powder, fruit, flax seeds etc. and you have one nutritious meal. I've had my processor/blender for more than 12 years and it's still going strong. This 600-watt motor can handle almost anything. If you cook several times a week or more, this will be one of the best investments you can make. The food processor family would not be complete without the baby version. How I love this little guy. Its great for small jobs like chopping herbs, onions or garlic, making mayonnaise, aioli and dressings, pesto, and best of all it doesn't take up much kitchen space. If you want to julienne carrots and zuchinni, make waffle fries, slice onions and tomatoes, shred cabbage for sauerkraut or beets for kvass, and do it all in a jiffy, you need one of these. Easy to arrange and clean after use, your family and guests will love your meals and lovely presentations made possible with this gadget. Tara at Feels Like Home has a post about all the things you can make with a mandoline. Check it out here. I love making my own yogurt! I don't like most store-bought yogurts - too much sugar and additives. In less than 15 minutes of prep, you can put your milk and cultures into these perfect serving-size jars and let it go to work in an afternoon or overnight depending on how tart you like your yogurt. You can use regular milk, coconut milk, etc. If you have kids, they may enjoy helping you make this. Best of all when its done, you get to add whatever you want to the yogurt.. berries, banana, apples and cinnamon, use it to make dressings, tzatziki, sauces etc. So good and good for you! This yogurt maker is affordable and includes easy to follow instructions. You'll need to buy yogurt cultures. 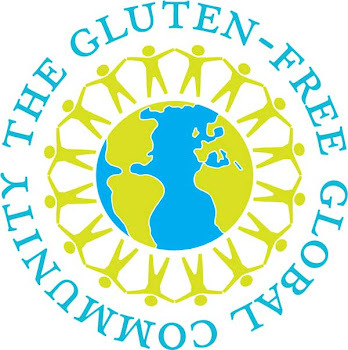 I buy all of my cultures from Cultures for Health, and many other people in the whole health food community like them, too. Their website has a variety of different yogurt cultures to choose from, as well as cultures for kefir, bread making, you name it they have it. This is a mid-grade juicer, but it works perfect for me. I use my juicer every couple of weeks to make green juice. My favorite right now is: kale or spinach, celery, carrots, green apple, ginger and lemon. It's a good detox drink for a weekend breakfast especially when I've overdone myself eating too much junk during the week. Hey, it happens sometimes, and my liver and kidneys need some help. If you don't mind spending a bit more, the one below extracts the pulp for you and is easier to clean, and gets great reviews, too. Tip: Instead of throwing away the veggie pulp which still contains nutrients and fiber, check out Erin's blog Plan to Eat which gives some great ways to use the pulp. Zuchinni and Carrot bread, even sneaking veggie into your kid's mac n cheese. Brilliant. Love love love my crock pot. Who doesn't love coming home to the delicious smell of dinner waiting for you? I use my crock pot to make traditional chicken and bone broths quite often. Yesterday I made some Galbi, an Asian marinated short rib (beef or pork). We plan to eat these tonight with some brown rice and kimchee. They smell so good I can't wait! The Crock-Pot below has several settings, and a setting to keep your food warm when it's ready and you're not. It also has a portable crock with a securable lid to take your food to a family gathering at a park picnicor a holiday pot luck. I guess I could use my Cuisinart blender to puree soups, but then I'd have to pour the hot soup in and out of the pot, which can be cumbersome and dangerous. I'm asking for an accident. Instead, I use this easy to use and clean tool when I want to make sauces and pureed soups. This week I will be making a butternut squash sage soup with some of the chicken broth I made in my crock pot, and will also use some cashew cream that I made in my food processor. The Emulsion blender blends in a matter of minutes, incorporating all of the ingredients together. Over 1,300 reviewers average this Cuisinart emulsion blender four and a half stars. One reviewer calls it the Audi V8 of the blender world. I picked a zester up at Cost Plus World Market for about $9. I love this thing! Much better than a cheese grater, it creates a finer zest which means more flavor added to your soups and sauces. Use it to grate citrus zest, hard cheeses and ginger. I use a lot of ginger in Asian dishes, and get a lot more flavor using a zester. I believe this is the same one I have. More than 77 reviewers gave it five stars on Amazon.com. These tools can help you create meals in a fraction of the time it would otherwise take. Even if you enjoy cooking, I can bet you have other activities you want to get to, like spending time with your family at the beach! No beach? So sorry, you should really move to Southern California. Wait! I take that back - we have enough traffic as it is. A few days ago the mainstream media released details of a study by Stanford University, in which findings state that little evidence was found organic foods were more nutritious than conventionally grown foods. Ya don't say?? I honestly never thought there was a significant difference nutrient-wise. And by the way, Stanford doesn't define what they mean by "significantly nutritious" in their study. I was shopping at my local grocery store, filling my cart full of veggies, meats and nuts, when a fellow shopper looked in my cart and commented, "You must be on that Atkins diet." I explained to him that I was not on a "diet," rather a lifestyle that most call Paleo. I told him I don't eat grains such as wheat, rice, or beans and that I get my fiber from all of the vegetables and (occasional) fruit I eat. I told him that I believe most animal fats are good for you. He said that sounded hard and expensive to do and he didn't know what he would do if he couldn't eat bread, pasta, potatoes or rice. I explained that a diet full of vegetables and protein keeps you full and satisfied, and I feel healthier making the change. As most of us who follow Paleo know, most grains lack many nutrients and even contain anti-nutrients like phytates and can actually promote inflammation. In the case of simple carbs like potatoes, white rice and processed flours, they can exhaust your pancreas with over production of insulin resulting in weight gain and degenerative diseases like diabetes. 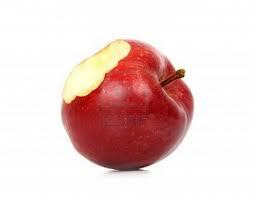 For more information about why grains should not be a staple, check out Mark's Daily Apple article "Top 8 Most Common Reactions to Your Grain Free Diet and How to Respond." I think it covers many of the bases and will help you respond to people who have many questions, especially because grains have been part of our diets for a long time, albeit you are not getting optimal nutrition. If you've recently decided to start this lifestyle, but need some help through the challenging phase of figuring out what to eat for each meal of the day, this post is for you. Keep in mind that I am not always a die-hard Paleo follower, and some of these recipes may have dairy or the occasional potatoes or rice, but that is usually to accommodate my non-paleo partner (I'm still working on him, wink wink) or for those readers that are just gluten free and not necessarily Paleo. 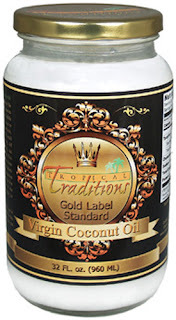 Tropical Traditions Organic Coconut Oil Giveaway! I love me some coconut oil. Using organic, unrefined coconut oil is a large part of my initiative to live a greener, healthier, and more natural lifestyle. Since I started using it about a year ago, I rarely use anything else. It's benefits and uses are endless. I use it for cooking and baking, lip gloss, skin and hair moisturizer, and more. What's great is that there are no icky chemicals and preservatives like many other products on the market. If you ask me, less is more! 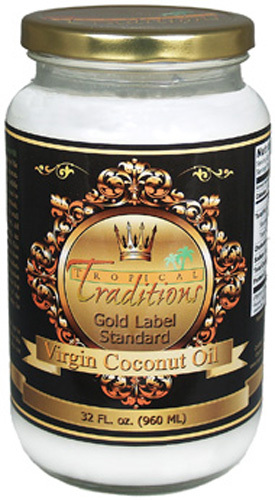 I'm excited to announce that Tropical Traditions will giveaway a quart of this healthy, unrefined oil to one lucky winner. When you sign up for their newsletter (one of the requirements to enter the contest) you can be the first to receive specials and sales they are offering.